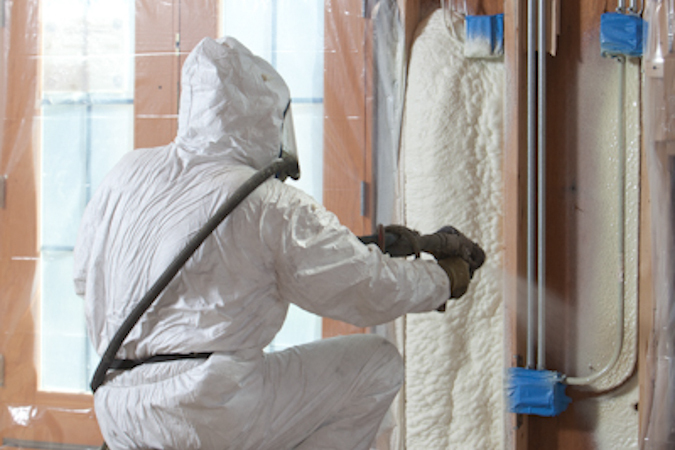 Spray foam insulation is an energy-efficient alternative to traditional fiberglass insulation. A two-component mixture composed of isocyanate and polyol resin comes together at the tip of a gun, and forms an expanding foam that is sprayed onto roof tiles, concrete slabs, into wall cavities, or through holes drilled in into a cavity of a finished wall. Studies by the US Department of Energy show that spray foam insulation minimizes air infiltration through walls, windows, and doorways, saving an average of 40% on energy costs and utility bills when compared to a home with traditional insulation products. R-value, the term given to thermal resistance to heat flow, is higher than traditional fiberglass insulation. The higher the R-value of an insulation product, the better performing the home. A 1.8 to 2 pound foam insulation has the highest R-value of readily available insulation used in homes and buildings. In addition to providing a more comfortable living environment and lower utility bills, spray foam insulation has been shown to serve as a barrier to airborne sounds, and reduces airborne sound transfer through a home’s roof, floor and walls.